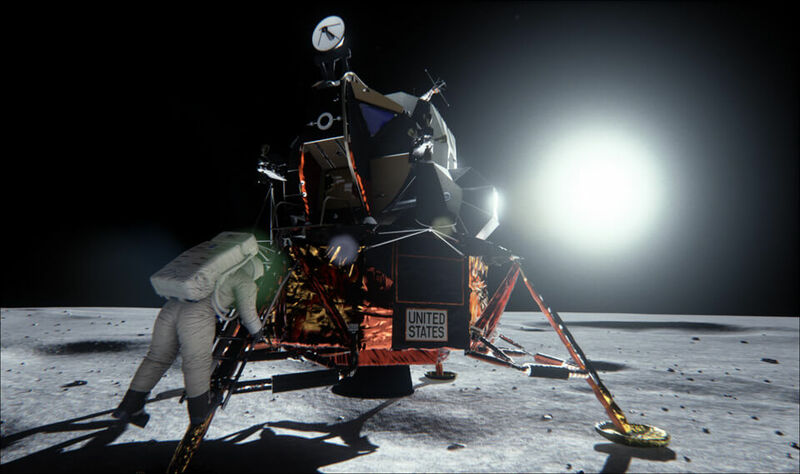 By using its new dynamic lighting technology, GPU manufacturer NVIDIA has graphically recreated the Apollo 11 moon landing site — and the results are crushing a number of wild claims made by conspiracy theorists. Yes, it’s a clever bit of self-promotion, but what NVIDIA Corporation’s developers have done is actually quite interesting. To show off the power of its new Maxwell graphics processing unit (GPU), Nvidia’s game demo team sought to digitally reconstruct one of Apollo 11’s most iconic photographs — Neil Armstrong’s shot of Buzz Aldrin as he climbs down the lunar module’s ladder. Why that picture? Because it’s a popular target used by moon landing deniers to bolster their claim that it never happened. The photo, taken in 1969, shows Aldrin lit against the dark landscape of the lunar module behind him. But conspiracy theorists argue that, because the sun is behind the lunar module, and because Aldrin is in its shadow, Aldrin must have been lit by something other than the sun — like artificial lighting in a studio. The developers also used Maxwell to bunk two other (supposed) issues: the absence of stars in the background, and to answer the question as to why, given the position of the sun behind the lander, details can be seen that would otherwise be obscured by shadow. The demo team went to work by tapping into one of Maxwell’s key technologies, Voxel-Based Global Illumination (VXGI). This past Thursday, the company unveiled two new graphics cards, the GeForce GTX 980 and GTX 970, both of which are equipped with VXGI, which renders real-time dynamic lighting. VXGI allows Nvidia’s game developers to better represent the way light bounces from one object to another in real time. It does this by breaking a scene’s geometry into thousands upon thousands of tiny boxes called “voxels,” or 3D pixels. Each of these six-sided voxels is analyzed to figure out its level of transparency (opacity) and its emittance, which is how much, and what color, light reflects from other objects in a scene. Put together, these boxes capture the dynamic way light bounces from one object to another — including what happens when a character moves in front of a light source. To graphically simulate the moon landing, the demo team gathered as much information as they could. They even researched the rivets on the lunar lander, identified the properties of dust coating the moon’s surface, and measured the reflectivity of the material used in the astronauts’ space suits. Original photograph of Buzz Aldrin at right, and the computer-generated image at left. During this stage, the team uncovered an important clue: A video clip showing Aldrin descending the ladder had a bright spot of light that appeared to move every time the camera did. “When the glow started moving, I thought, ‘Oh my gosh, that’s it,'” noted team leader Mark Daly in a Nvdia blog post. A senior GPU architect suggested that it wasn’t artificial light — but a reflection from Armstrong’s bright white suit. Daly was skeptical, but their models were able to reproduce exactly how the light was illuminating Aldrin’s suit at the precise moment Armstrong snapped his photo. So, using the Maxwell GPU, the demo team rebuilt the scene of the moon landing in Unreal Engine 4, a game engine developed by Epic Games. They were able to show how the sun’s rays — coming in from behind the ladder — bounced off the moon’s surface and Armstrong’s suit, to cast light on Aldrin as he stepped off the ladder. The visual recreation also addressed a common issue brought up by conspiracy theorists: photos from the landing site don’t show any stars. Fascinatingly, the demo team used Maxwell to find them. Why Isn’t the Footage Obscured by Darkness? The conspiracy theorists who question why the footage isn’t obscured by darkness don’t take into account how light from the sun interacts with the moon’s surface. The fine lunar dust covering the moon has mirror-like properties, reflecting the sun and illuminating objects on the surface. “The sun is hitting the dust, and it’s illuminating the backside of the Apollo module and astronaut,” says Herkelman. “It turns out there is a lot of information about the astronomical bodies floating out there in space,” [Daly] explains. “Starting with the sun. The sun itself is 128,500 lux — that’s lumens per square meter – but it turns out the moon is a crappy reflector of light.” Daly discovered that the moon is only 12-percent reflective, and absorbs most of the sunlight hitting it. On the other hand, 12-percent of 128,500 lux is quite a lot. “It’s the equivalent to ten 100-watt lightbulbs per square meter of light bouncing off the moon.” More than enough make Aldrin visible under the lander’s shadow. The findings were particularly satisfying to Daly.